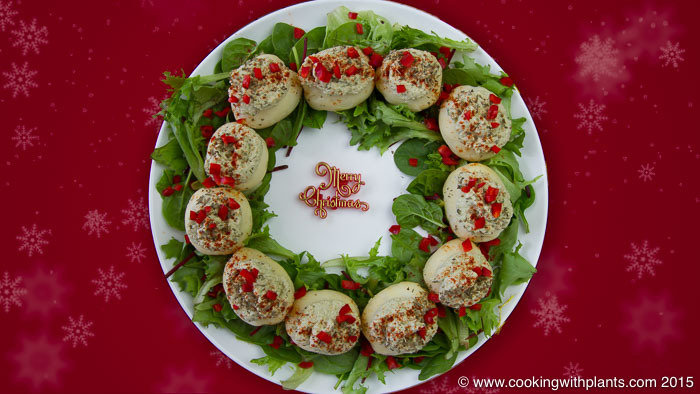 This edible potato christmas wreath is easy to make, looks impressive and tastes great! A perfect recipe to include as part of your holiday lunch or dinner feast. Such a fresh and colorful addition to any christmas table and healthy for you too. Get a large round platter that you would like to have your edible wreath on. Work out how many potatoes you will need by lying them around the outside. Then boil them in their skins until cooked through but still firm (mine took about 25 minutes). Run them under cold water once cooked to get the skins off easily with your fingers. Set aside. Prepare your dip if not using store bought. I used my Sunflower Seed Dip (see notes below for recipe link, but you could also use hummus or any light colored dip you like. Place in a zip-lock bag for piping later. Lay lettuce mix around the outside of your platter. Leaving space in the center so it resembles the look of a wreath. Place your boiled potatoes (or baked if you prefer) over the lettuce in a full circle. Cut one corner off your zip-lock bag and pipe on your dip evenly onto each potato. Sprinkle with paprika and herbs. Top with a sprinkling of chopped red peppers. For the dip, I used a double batch of my Sunflower Seed Cream Cheese recipe. You could also use my no oil hummus recipe. The key is to get a lovely fresh mix of red and green vegetables to bring out the christmas colors. You could also use chopped cucumbers, broccoli, olives etc if you prefer.